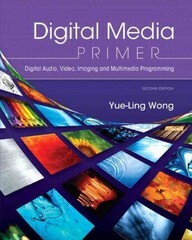 Digital Media Primer 2 Edition Digital Media Primer is designed for students from all disciplines interested in learning the foundational concepts and basic techniques in digital media production. The Second edition has been expanded so that while readers learn the concepts and techniques of digital media production, they will also learn basic computer programming skills. The Primer is not tied to a specific application program like Flash or Photoshop; instead, the author introduces tools and techniques using a task-based approach and provides the rationale for the techniques. This way, the skills readers learn are transferable to whatever tool they end up using or have access to. For readers that do not know how to navigate certain tools, Wong provides brief Application tutorials as supplemental material.